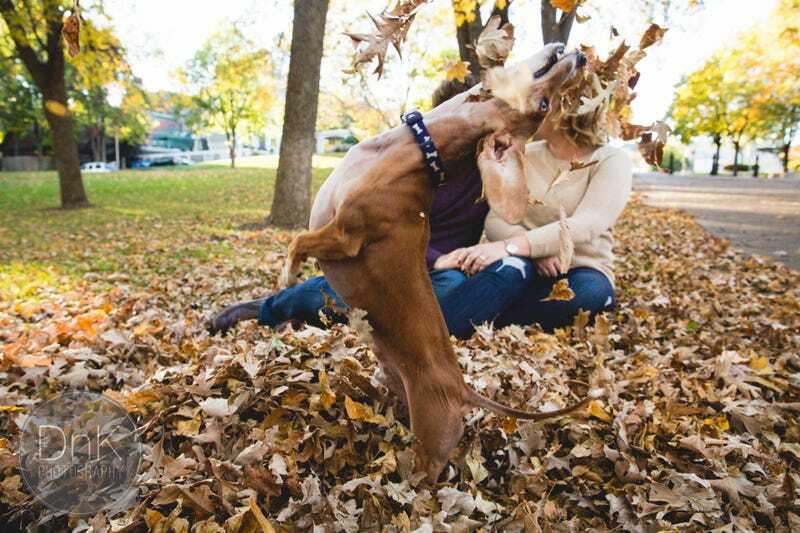 If engagement photos are meant to reflect an entire relationship, then it’s no surprise that so many people include their adorable pets in the shoot. Most of the time, the animals just chill (as animals do when stuff is boring and you’ve given them a snack), but sometimes they forget they’re not the star of the show and roll right into the action, turning the camera on themselves and demanding their closeup. Like Louie, the Norma Desmond of a Minnesota couple’s expensive photo day. If there’s anyone to blame for Louie’s grandstanding, it’s his owners Megan Determan and Chris Kluthe, who wanted to include him in the photoshoot with DnK Photography because he’s a large part of their family. And as anyone who tries to include pets in important events knows, you kind of just have to roll with it. Even if the pet is blocking your future husband to assert dominance as the only love in your life. “It just made sense to have him in the pictures because he’s our dog,” Determan said. They just never expected Louie to overshadow their moment. In the photo, the 6-year-old dachshund jumps in front of the couple just as the camera snapped a picture. “I knew he was going to be in the shot. I didn’t know he was that much in the shot,” Kluthe said. Is that behavior out of character for Louie? Determan says no. Even though the trio are a family now, Louie and Determan were hanging tough on their own before Kluthe arrived. And that shows. “I feel like Louie’s always just kinda like that. Anytime I go to touch Chris, he’s like, no, I want to be pet,” Determan said. In the picture, Chris is the only one perfectly blocked from view. Louie’s body is positioned in a way that he’s blocking Chris, but Megan is in the background. That dog knew exactly what he was doing. Check out his stance, his ears, his facial expression. He’s owning this photo and there’s nothing anyone can do about it. And, if worse comes to worst and the couple don’t stay together, Determan will always be able to keep this engagement picture on display. The photographers who directed the shoot say they wouldn’t usually deliver such a picture to the bride and groom, but this one was just too, too perfect. And it is. Now the happy couple just has to decide whether they’re going to let Louie be a part of their wedding. Lead image via DnK Photography; used with permission.